Cool! Save an average of 20% on DebShops with 4 Coupon Codes, and 46 Deals! 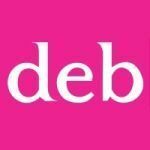 Deb is a specialty women clothing and accessories retailer with 337 stores across the U.S. It sells private label apparel for women and complements that with trendy shoes, scarves, hats, totes, and belts. Customers are fond of discounts they can get on the latest clothing lines at Deb. Details: FREE SHIPPING on all orders over $50. FREE RETURNS to any Deb Store. Details: 25% off Flip Flops and Sandals. Limited time. spend more than $50 and get free shipping. Details: Spend more than $50 and get free shipping. Details: 25% Off Sandals! Limited time. Details: ALL COATS are 25% OFF in stores and online. FREE SHIPPING on all orders over $50. Ends 09/25/2013. Details: Get 30% off Sitewide. Expires on 01/29/2014. Details: Get Extra 10% Off any purchase. Expires on 01/31/2014. Details: 20% off Party Dresses. No code needed. Prices as marked! Details: July 10th Only - 60% off All Clearance. No code needed. Details: All Boots $29.99 + Free Shipping on orders of $50+. No code needed. Details: 50% off Blowout Sale + FREE SHIPPING on $50+ order! Details: 30%-50% off All Tops! Details: Up to 60% Off Clearance Online & In-Store! Details: 30% Off sitewide. Excludes Homecoming Dresses! Details: 30% Off All Shoes + Win Free Boots! - FREE SHIPPING on all orders over $50. FREE RETURNS to any Deb Store. Details: Get 40% off sitewide + Free Shipping on $50+. Expires on 12/10/2013. 40% off everything + free shipping on all orders over $50. Details: 40% Off Everything + FREE SHIPPING on all orders over $50. Details: 20% off Everything Earth Day Sale + FREE Shipping over $50. buy one get one 60% off entire store + hourly deals! Details: Buy One Get One 60% Off Entire Store + Hourly Deals! Details: 50% Off Everything – Cyber Monday. Expires on 12/02/2013. 60% off all clearance boots! Details: 60% off All Clearance Boots! Details: 10% Off When You Sign Up + Free Shipping on $50+. Details: 50% Off Denim. No code needed.